Daphne’s Greek Cafe announced the launch of its new Pita Melts, which are Greek-inspired sandwiches offered in three flavors: Grilled Chicken Pesto, Fire-Roasted Veggie Pesto, and Fresh-Carved Gyros. Daphne’s Pita Melts combine grilled pita bread with signature Daphne’s flavors and melted cheeses, and are available for $5.99 each at all 59 locations in Arizona, California, and Colorado. Daphne’s Grilled Chicken Pesto Pita Melt features Mozzarella cheese, pesto, Feta cheese, and grilled chicken breast layered with grilled Roma tomatoes. The Fire-Roasted Veggie Pesto Pita Melt is a mixture of Mozzarella cheese, pesto, Feta cheese, grilled green bell peppers, and grilled tomatoes. The Fresh-Carved Gyros Pita Melt is a meaty, cheesy combination of Daphne’s signature sliced gyros layered with American cheese, Daphne’s sauce, and Feta cheese. In addition, Wreath Equity LLC purchased Daphne’s Greek Cafe on August 6, at which time William Trefethen was named CEO of the company. Wreath Equity, comprised of New York–based Garrison Investment Group and Scottsdale, Arizona–based Trefethen Advisors LLC, identified the company’s tremendous potential and will infuse Daphne’s with capital. 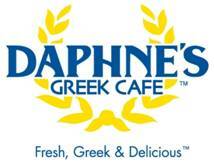 Daphne’s will be repositioned through a dynamic marketing plan, new menu choices, and guest promotions.